Making his return to the stage of a live event for Apple for the first time in a year, Apple CEO Steve Jobs unveiled iTunes 9, the latest version of Apple's music and video jukebox software, available for download for Mac OS X and Windows today. Genius Mixes were the first major feature Jobs announced. With more than 27 million libraries built from more than 54 billion songs submitted and analyzed, the software is now ready to create Genius Mixes, which Jobs likened to having a personal DJ at a radio station catering just to your taste. Genius Mixes goes beyond music, however. 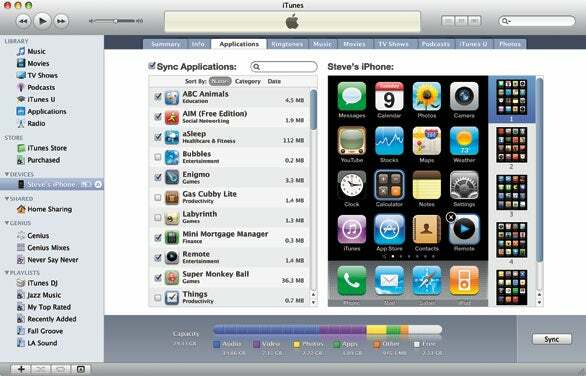 Movies can also be categorized using the new technology, and the same goes to apps installed on the iPod or iPod touch. Home Sharing brings iTunes synchronization to a new level. Up to now, it hasn’t been easy to synchronize iTunes between multiple computers without the use of scripts or third-party applications. Now you can copy songs, movies, and TV shows among up to five authorized computers in your house. You can see each of the computers operating as part of that shared group, stream each others’ contents, and drag and drop content from one library to another. Users’ interaction with the iTunes Store has been dramatically improved, with new artist pages, better navigation, new movies pages, and new TV pages. The artist pages have gotten a dramatic overhaul, with much more visual material added. Music, photography, liner notes and essays are the centerpiece of the new feature, which Apple calls iTunes LP. The iTunes LP metaphor has also been extended to movies and videos; a new “iTunes Extra” area lets you view extra content, like that which is included on DVD and Blu-ray Discs. iPhone and iPod touch application management has become a nightmare, particularly for those who have large numbers of apps. Apple’s solution, new in iTunes, is the ability to organize your apps in iTunes rather than on your iPhone or iPod touch. A new interface lets you list your iPhone’s home screen, rearrange the location of applications, search for apps, and more.